There are three people represented here in this knife, me, Scott Teaschner and Pete Crowl. Of course, me - the knife, Scott - the sheath, and what you guys may not know, is that Pete Crowl, J.S., creates this spalted maple. To do it requires Pete to cut down a certain sized maple tree at just the time of year so that it contains the right amount of sap. Then he cuts it up, covers it up and baby sits it out in the woods for a year or more always keeping it at the right moisture, checking for spalting, etc., etc. Then he has to cut it up into blocks, dry it, stabilize it, and so forth. And I'm proud to have it on this knife. 1095 Hot-blued Damascus, hot-blued mild steel take-down fittings, stabilized spalted maple handle and Cape Buffalo/tooled sheath. A nice collaboration between myself and Scott Teaschner. I managed to make a nice fighter with laddered Ws of 1095 and 15N20, and mated it up with some twisted wrought iron for the guard and a beautiful block of stabilized "Paint Brush" Walnut. Blade was hot-blued and ready to rumble! Scott pulled off another of his creations with an Ostrich inlay on a beautifully tooled high grade leather sheath - like only Scott can do! 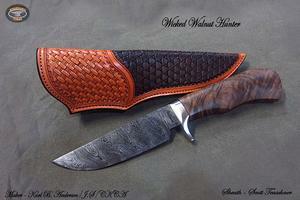 Another one of those Teachner sheaths that really improves a knife "package" from Andersen Forge. Scott's precisely tooled sheath really compliments this hot-blued 1095 Twist hunter with some stabilized "Paint Brush" walnut from Kentucky!! This take-down hunting knife and sheath combination would certainly make the owner the 'best dressed' hunter in camp that week! This knife was forged from a 1 1/2" round bar of W2 and clay processed during the hardening portion of the heat treatment, and then etched to expose the hamon. The fittings of stainless steel are matched in an octagonal shape to mate pe4rfectly with the octagonal African Blackwood handle. This little beauty was from the very first bar of twist Damascus that I made with my "Mister Twister" machine! High layer steel and twisted quickly at high heat results in what I call "Wispy Twist"! The guard was also twisted from a bar of 1903 fine grade wrought iron. Now, this handle is from some "secret stash!" feather "paint brush" walnut I acquired from a buddy in Kentucky, and then had stabilized. 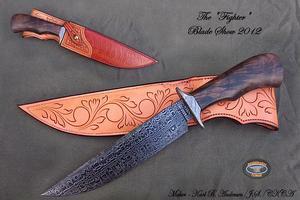 Here's a fantastic 9" Fighter made with some highly hamon-active W2! The differential hardening zones are easily displayed in shallow hardening steels like W2. The full take-down assembly includes stainless steel fittings and a fabulous block of stabilized Redwood Burl for the handle. 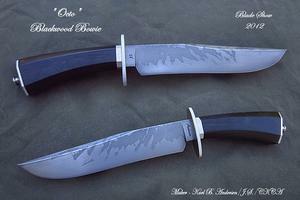 Another example of a knife that is SOLD! before it makes it to the web site "Available Knives" page. 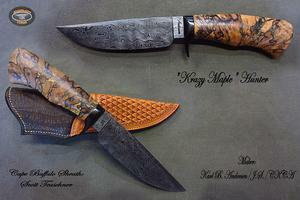 Please, please get on my email list so you, too, can get email notifications of new knives as they get completed. 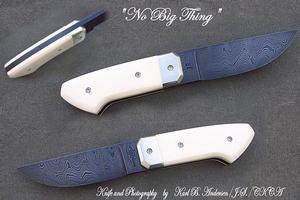 In building No Big Thing, I wanted to convey the image of a knife that was small enough to consider as an Every Day Carry knife, yet would also be hefty enough and stout enough to perform most duties often chosen for much more substantial knives. And, do it with class and individuality. She will get a pouch style sheath with a snap-on flap covering the handle. 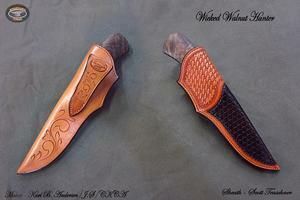 Sort of like the folding Buck 110 sheath. The steel is laddered and hot-blued 1095 and 15N20, nickel silver bolsters and the scales are some of the original pieces of Ivory Micarta handle material I purchased when I started making knives in the late 90s. Scales and bolsters are double pinned as well as screwed. 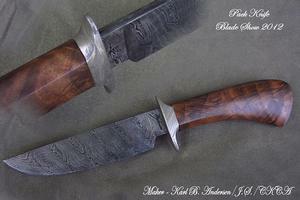 This African Blackwood hunter was designed with a blade of 1095 tool steel wrapped in a jacket of 416 stainless steel. A premium African Blackwood handle and stainless steel take-down hardware complete a wonderful hunting package that would be the showcase of hunting camp - anywhere! 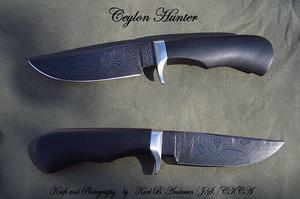 This is one of those knives that seem to only come along every once in a while for a maker. Everything just came together for me on this one. All of the components seem to compliment each other quite well. Stainless steel take-down fittings complete a wonderful version of a hunting knife at its best. I'm proud to offer it here to the descriminating hunter. Here is an interesting process that I have been working on occasionally for about two years. It's a very demanding process that bonds/welds stainless steel on both sides of a tool steel core. This process is called San Mai. The resulting effect is a hard-working tool steel blade that is protected from corrosion over about 75-80% of its surface. And, it just looks cool as well! 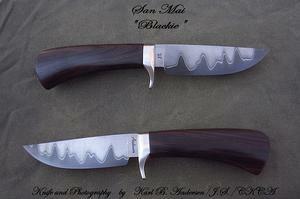 I mated this San Mai blade up with some very highly curled Maple that I sent of to be through-dyed and stabilized. Within minutes of posting this knife, there was a small avalanche of people wanting it. Only the first one with the $$ got to add it to his collection. Get on the San Mai list today! !